The book of Haggai is short and simple, depicting the time of Haggai the prophet and his main work in delivering the message of the Lord to Zerubabel, regarding the rebuilding of the temple, 16 years after Zerubabel had laid the foundations. The message of the Lord is clear – while the house of the Lord remained incomplete, the people were not concerned and were busy perfecting their own abodes. In this study, we will examine the context of the state of the houses then, and attempt to metaphorically apply it to our lives today. living in your paneled houses – the original meaning of the term used here is the word used to refer to palaces – very extravagant, very luxurious. It implies that they weren’t just living in secure houses that they built for themselves in order to just have a roof over their heads. 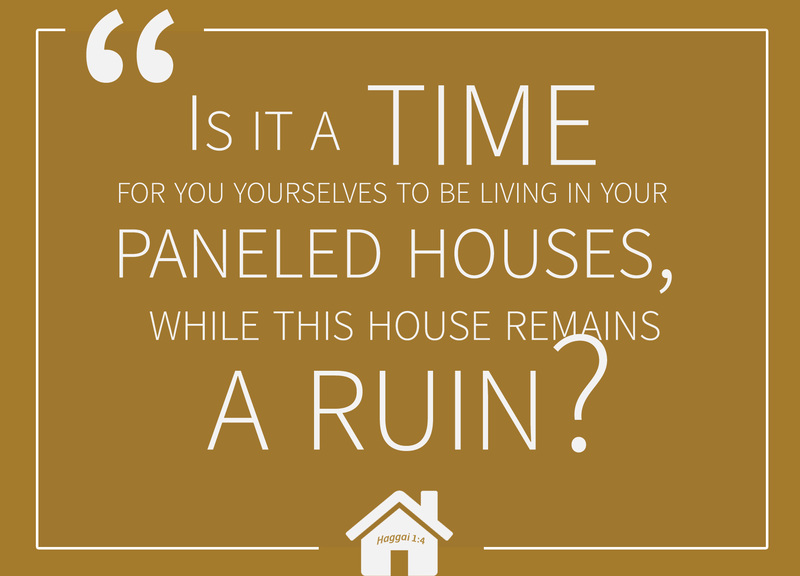 No – they even had the luxury of time, money and resources to panel their houses up with good wood or something. It was more than just secure – it was a comfortable place to stay in, luxurious for the people of that time, and luxurious for the people who were still not granted complete freedom. Jeremiah gives us an idea of what a panel house would consist of – He says, ‘I will build myself a great palace with spacious upper rooms.’ So he makes large windows in it, panels it with cedar and decorates it in red [Jer 22:14]. This can perhaps also be taken as a metaphor for our secular, everyday lives – it gets comfortable. while this house remains a ruin – The temple was destroyed by the Babylonians indeed, an entire superpower regime ago (at the point of Haggai, it was already King Darius’ era, deep into the Persian era). However, 16 years prior to the context, under the sanction of Cyrus the Great, Zerubabel had laid the first foundations of the temple as part of the rebuilding [Ezra 3:8-11]. 16 years had past with the foundations still there – a house that neither looks like one, nor functions as one, with nothing but its foundations. The temple was an important symbol throughout the history of Jerusalem – indeed, even till today. While the people couldn’t do much when Artaxerxes the King put a halt to the rebuilding works, he was no longer in power. Yet the people did not try to do anything regarding the temple. They have forgotten about it – Because of my house, which remains a ruin, while each of you is busy with your own house [Haggai 1:9]. Contrast this with the likes of King David, who fretted over the state of the house of the Lord – “Here I am, living in a house of cedar, while the ark of God remains in a tent.” [2 Sam 7:2] – Indeed, if not for David, there might have been no temple at all. Metaphorically, this is the spiritual state of the people – physically and mentally, secularly in their everyday lives, they were doing well. But their spiritual health? In ruins! is it a time for you – Time. That is the crux of the matter. There are some things, like crimes, like sins – that we obviously shouldn’t be doing at anytime, and at all times. Then there are other things, like this matter in verse 4, that is a matter of time. Is it wrong to be living in panelled houses? No – not really. It isn’t a crime, and cannot count as a sin. Is it their fault that the house of the Lord remains a ruin? No – not really. More of their ancestors’ faults, and while under captivity, there was nothing they could do about it. God knows that too. There is a time for everything, and a season for every activity under the heavens [Ecc 3:1|Article]. And God’s timing is divine. Under a different king they might have been unable to continue rebuilding the temple, but Darius was a king who supported and encouraged alien religions as long as they were peaceful ones. The Lord is asking a rhetorical question, and the answer is a clear and resounding ‘No’. It is not the time to be enjoying the comfort of our panelled houses when the house of the Lords is in ruins. God does not ask questions like that without more assistance – he pushes and prods the people into action through his prophets, and he rose up Zerubabbel by calling him his signet ring [Haggai 2:23]. We may not have ruins of temples literally for us to build today. However, metaphorically, in each of our hearts, there is a house of the Lord – and many of us have ruined houses of the Lord. Let us not enjoy success and luxury in our secular everyday lives and yet at the same time have an unhealthy spiritual state. If anything, let our houses of the Lord be panelled like palaces, and rather we stay in tents and in ruins – secularly speaking.